William Lambers is an Ohio based journalist who has been published by the New York Times, The Huffington Post, Cleveland Plain Dealer, Cincinnati Enquirer and many other news outlets. He is a member of the Feeding America Blogger Council. When another governor, Franklin Roosevelt, was running for President in 1932 he had a strong record in New York of feeding the hungry. It was Roosevelt, in a speech in Buffalo before the election, who said, "It was the duty of the State to see to it that none of its citizens went hungry." Governor Roosevelt championed programs to help the poor and homeless. The same held true for Roosevelt as president. When he made a campaign speech in Boston before his 1940 re-election bid, he talked about the importance of agriculture and fighting hunger. Roosevelt said, “Surpluses not needed for reserves are now being used to feed the hungry and the ill-nourished.” And Roosevelt praised the fact that 3 million children were getting school lunches during his administration, which was the forerunner of a national program signed by Harry Truman in 1946. President Roosevelt's philosophy is one all should follow: "The test of our progress is not whether we add more to the abundance of those who have much; it is whether we provide enough for those who have too little." When John F. Kennedy was running for president in 1960 he was very moved by the plight of the hungry and unemployed in West Virginia. He vowed to help them through difficult times. In fact, one of Kennedy’s first orders as president gave food aid to West Virginia and other states in need. Likewise Kasich has fought hunger in Ohio, where food insecurity rose dramatically after the economic recession that started in 2007. Kasich has supported plans like the Ohio Food Program and Agricultural Clearance Program. These initiatives provide fruits, vegetables and other nutritious food to the 12 Ohio foodbanks. These foodbanks, part of the Feeding America network, provide emergency relief to the hungry. Lisa Hamler-Fugitt, the director of the Ohio Foodbanks, said recently, “Governor Kasich has risen to the challenge. He’s responded at a critical time to keep food pantry shelves stocked and food on the table for local families. His leadership and investment in hunger relief helps our member foodbanks respond to the growing need in their communities." Governor Kasich and First Lady Karen Kasich have supported the weekend backpack plan that feeds hungry children. During the school week needy children can receive the free school lunch and breakfast. But when weekends arrive they may come home to little or no food in the pantry. The backpacks give children food to take home on the weekends. The Cincinnati Freestore Foodbank calls them “power packs.” Hunger does not take weekends off and the backpacks of food keep children nourished so they can grow and do better in school. The food backpacks need to be expanded nationwide to help end child hunger. JFK understood the power of American food in terms of foreign policy. 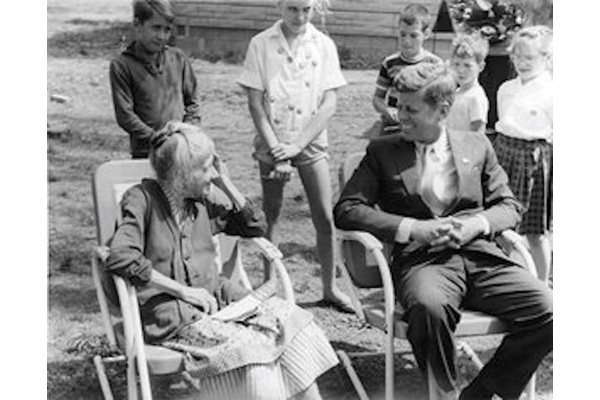 America’s Food for Peace program, started by Dwight Eisenhower, was expanded during JFK’s administration. School lunches for needy children abroad was an area of special emphasis. Reagan added, "I wish more attention were paid to facts like these." Wouldn't it be great today if more attention were paid to the important work of fighting hunger abroad, especially with more starving refugees than any time since World War II. Kasich can be the one to do that for the Republican side. During his campaign he has spoken out against the blockade of food aid to civilians because of the civil war in Syria. As President, Kasich would be confronted with many urgent food emergencies like those in Syria and other war affected nations. The Food for Peace program can feed hungry war victims. Kasich, among the Republicans, has the right track record. As President Harry Truman said “No nation is any healthier than its children.” That is why food and nutrition must be a guiding principle in policy making for any president.